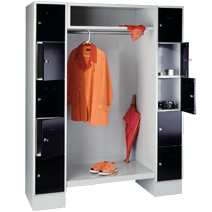 Our attractive office cabinets & open coat racks provide enough room for coats and jackets, clothes and shoes, personal valuables or even cleaning and care utensils in the smallest of spaces. We offer versatile technical and design solutions to match your requirements. This also includes the right solution for exceptional wishes regarding equipment, color, lock systems for our lockers and many more. Sturdy sheet steel construction with safety splays to avoid injuries. Smooth doors attached to the casing, fastened to interior hinges. Doors with integrated reinforcement, fastened on the right and left. 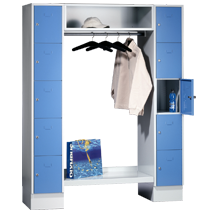 Clothes, cleaning utensils, laundry, material or security cabinet partition with a choice of 1 compartment, or 2, 3 or 4 stacked compartments. Security cylinder lock, 2 keys or cabinet bolt for padlocks. Various door finishes as standard selections, special finishes possible on request. 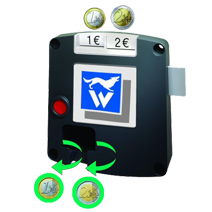 Extensive equipment and accessories range such as master key system, partition or numbering. Smooth doors with stamped in label frame, fastened to sturdy hinge band. Security cylinder lock with 2 keys or cabinet bolt for padlocks. Ventilation via easy-to-clean hole pattern in the back wall. Perforations in the side walls for screwing and attaching middle and side parts of the open coat racks. Deliverable with 1 and 2 compartments, and 5 and 10 shelves. Compartment width 300 and 400 mm, further dimensions on demand. Extensive equipment and accessories range such as deposit lock, master key system, slanting top, acrylic glass door or numbering. Available in many different combinations, can be configured individually. Deliverable in 750, 850, 1470, 1670 and 2220 mm width. 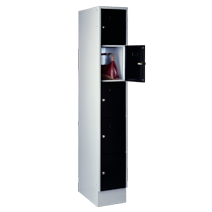 Shelves with compartment width 300 and 400 mm, further dimensions on demand. Coat hangers included in the delivery. Partially disassembled delivery, easy assembly – assembly material included in the delivery. For optional extension of open coat racks. 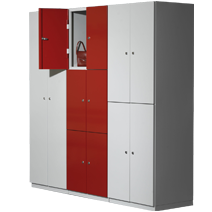 Extendable with coat lockers and side walls. 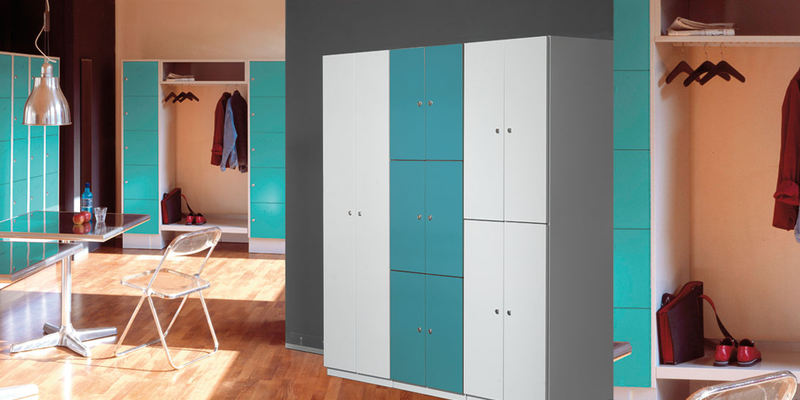 Extendable with coat lockers and spacers. Are you looking for custom builds or special solutions for your steel furniture? Why don’t you take advantage of our competence for custom builds and special finishes based on our standard product range? We look forward to hearing from you and we would be happy to prepare a detailed offer for you. 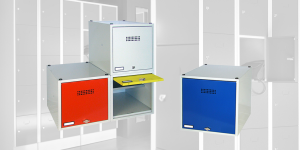 New series 46 and 47 cubic lock boxes available as from now!